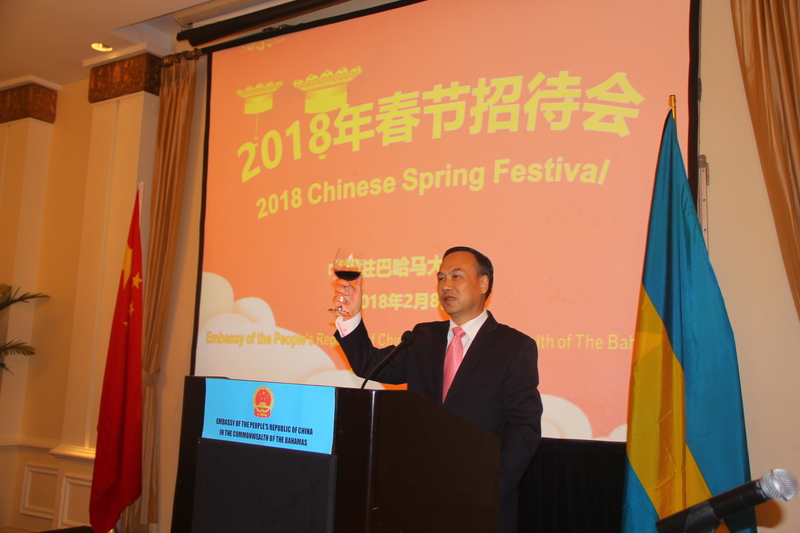 Welcome to the 2018 Spring Festival Reception hosted by the Embassy of the People’s Republic of China in the Commonwealth of The Bahamas. As a old Chinese saying goes, The golden rooster has reported the victory, the brilliant dog welcomes the spring. On the occasion of the Chinese New Year, on behalf of the Chinese Embassy in The Bahamas, I wish everyone present, Chinese and Bahamians who care and support the development of China-Bahamas friendly relations a happy and prosperous new year. The past year of 2017 is of epoch-making significance in China’s development. The 19th National Congress of the Communist Party of China has been held successfully, which established the Xi Jinping Thought on Socialism with Chinese Characteristics for a New Era and embarked on a new journey of building socialism with Chinese characteristics. In the year of 2017, China’ economy has maintained a sound momentum of development with a GDP growth of 6.9 percent. Over 13 million urban and rural jobs have been created. Various initiatives to improve people’s livelihoods have been accelerated. More than 12 million rural residents have been lifted out of poverty. The social pension insurance system now covers more than 900 million Chinese people, and 1.35 billion people are covered by basic medical insurance. A series of innovative scientific achievements have been made, such as Fuxing bullet trains, the large passenger airliner and the quantum computer, which demonstrated the creativity of the Chinese people. The overall environment of China has been improved steadily. In general, the Chinese people have enjoyed a stronger sense of gain, happiness and security. Under the strong leadership of the Central Committee of the Communist Party of China with Comrade Xi Jinping as the core, China has hosted several multilateral diplomatic events in China, including the first Belt and Road Forum for International Cooperation, the BRICS Summit in Xiamen, and the CPC in Dialogue with World Political Parties High-Level Meeting. China’s diplomacy has made a series of achievements in firmly safeguarding China’s sovereignty, security and development interests, advancing China’s diplomatic agenda in a comprehensive way, playing an active role in global governance and promoting the joint-building of the “Belt and Road”initiative. China has made great contribution to the development and progress of human society while its international status and influence have been further enhanced. The year of 2017 is also a year of great importance for China-Bahamas relations. The 20th anniversary of the establishment of diplomatic relations between our two countries has been celebrated jointly. China and The Bahamas have always supported and cooperated with each other in international affairs with mutual political trust deepened. The economic and trade cooperation has been flourished. The Baha Mar Resort has achieved its completion and opening last year, which will create more than 5000 jobs and bring new vigor and vitality into the Bahamian economy and tourism. The bilateral cultural exchanges have been deepened. The “Chinese Style & Guangdong Image” Performance and Chinese Film Festival have been well received by Bahamian people. The Chinese government scholarships and short-term training programme have provided opportunities for Bahamian young people to study in China. The fruitful results of China-Bahamas friendly cooperation cannot be realized without the hard work of overseas Chinese, members of Chinese enterprises in The Bahamas and our Bahamian friends. I would like to express my sincere gratitude to all of you and I hope you will continue to care about and support China’s development. The Chinese Embassy is willing to make joint efforts with you to push forward the bilateral relations. We will continue to carry out the people oriented diplomacy, do our best to serve every Chinese people here and let you feel the warmth of your motherland. 2018 is the starting year of the comprehensive implementation of the spirit of the 19th CPC National Congress and marks the 40th anniversary of China’s Reform and Opening Up. China will be firmly committed to the path of reform and opening up, strive to turn the blueprint designed in the 19th National Congress of CPC into beautiful reality. China will firmly safeguard the authority and role of the United Nations and actively fulfill its international responsibilities and obligations. China will honor its commitments in countering global climate change and actively push forward the building of the “Belt and Road”. China will act as a peacemaker of the world, a global development contributor, and a defender of the international order. On January 22, The Second Ministerial Meeting of the Forum of China and the Community of Latin American and Caribbean States (CELAC) was successfully held in Chile. Chinese Foreign Minister Wang Yi attended the meeting, with other foreign ministers and representatives from Latin American and Caribbean countries. The meeting adopted the Declaration of Santiago and reached a consensus on building of the Belt and Road Initiative jointly. In November 2018, Chinese government will hold the first China International Import Expo in Shanghai. This is a significant action which shows China’s firm support for trade liberalization and economic globalization and opening itself to world market proactively. This will also be an important platform for other countries to demonstrate their national image, enhancing economic and trade exchanges and cooperation. China and The Bahamas are good friends who embrace mutual respect and treat each other as equals. The development of China-Bahamas relations has a profound foundation and a bright future. In the new year, we are ready to work with the Bahamian government to further promote mutual political trust, deepen win-win cooperation and exchanges in all respects, and further enhance the welfare of our two peoples. I believe, with the joint efforts of both sides, China-Bahamas friendly cooperation will achieve more positive results, and our bilateral relations will be elevated to a new level. To the health and happy family of everyone here, Cheers!